Ocean acidification has been called the “evil twin” of global warming. That’s because rising carbon dioxide levels are not just supposed to result in an overly-warm world. They are also supposed to result in an overly-acidic ocean. How does carbon dioxide in the air affect the acidity of the ocean? Well, the ocean absorbs a large fraction of the carbon dioxide that is in the atmosphere. Some of that carbon dioxide then reacts with the water in the ocean, producing carbonic acid. The more carbon dioxide there is in the atmosphere, the more carbon dioxide the ocean will absorb. As the ocean absorbs more carbon dioxide, more carbonic acid will be made. Thus, rising carbon dioxide levels will lead to a more acidic ocean. Now this might not sound like a big change, but the pH scale is logarithmic. That means if the pH decreases by 1 unit, the acidity has increased by a factor of 10! Thus, a drop in pH of 0.1 is actually a change of 26%. This means the ocean is 26% more acidic than it was before the beginning of the industrial revolution. If the models are correct (and who knows if they are), the ocean will increase in acidity by an additional 58 to 100 percent by the end of the century! As the water becomes more acidic, corals and animals such as clams and mussels have trouble building their skeletons and shells. But even more sinister, the acidity can interfere with basic bodily functions for all marine animals, shelled or not. By disrupting processes as fundamental as growth and reproduction, ocean acidification threatens the animals’ health and even the survival of species. How do Hardt and Safina know this? Because lots of studies have been done in which ocean organisms are placed in seawater that has been artificially exposed to enough carbon dioxide to make it much more acidic than normal, and the response of the organisms has been studied. While some of these studies indicate that the organisms either were not affected or flourished in the overly-acidic waters, many studies showed that the organisms were negatively impacted by the increased acidity. In particular, many species of coral respond negatively to acidic waters. A good overview of these studies (and others) can be found in the Royal Society’s special report, Ocean Acidification Due to Increasing Atmospheric Carbon Dioxide. Since I try to keep up with the scientific literature, I have come across such studies in the past. For example, while I was traveling to the Christian Home Educators of New Hampshire convention, I read a report in Science News about a study that indicated clown fish raised in overly acidic waters exhibit confused behaviors. For example, they tend to swim towards the scent of a predator instead of away from that scent, as they would in the wild.3 The problem I have with such studies is that they (1) raise the carbon dioxide level immediately and (2) are incredibly short term. Since I believe that the ocean organisms were created by God with an incredible ability to adapt to their surroundings, I think that the only realistic way to study how ocean acidification will affect ocean organisms is to do long-term experiments in which the acidity is raised slowly over time. Well, someone has finally done a study that is at least more long term than most of the ocean acidification studies that I have seen. Armin Form and Ulf Riebesell looked at a cold-water coral species called Lophelia pertusa, which is pictured above. 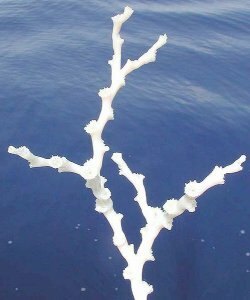 This coral is very common over a wide range of ocean environments, so it represents a good species to study. Also, the authors state that cold-water corals should be the most vulnerable to ocean acidification. In their study, they started by doing what everyone else has done. They put the coral in seawater with artificially low pH’s that came from exposure to artificially high carbon dioxide levels. They then watched the coral over a period of eight days. Like everyone else, they showed that the more acidic the water was, the slower the growth rate of the coral became. Growth rates in the long-term experiment (LTE) did not follow the negative trend with increasing pCO2 [decreasing pH] observed in the short-term incubation. Instead, growth rate, which was comparable to that of the control treatment in the short-term experiment, stayed high at elevated CO2 levels… Although not statistically signiﬁcant, a linear regression analysis reveals an increasing trend of coral growth with rising pCO2 concentration [decreasing pH]. In the end, then, a more realistic study produces a conclusion quite opposite the conclusions of most of the other studies that have been done. Given time, this species of cold-water coral ends up doing just fine (and perhaps a bit better) in ocean water that is significantly more acidic than today’s ocean water. Now please note that this still isn’t an incredibly realistic experiment. After all, the corals were not given a chance to experience a slow decrease in pH. Instead, the pH of the water was instantly lowered to the value the researchers wanted to test. An ideal experiment would not only give the corals time to adjust to the decreased pH, it would produce that decrease very slowly over a long time period. That way, corals would experience the kind of pH change that will actually result from rising carbon dioxide levels. Nevertheless, this experiment is clearly more realistic than most other experiments that have investigated the effects of ocean acidification. So perhaps the “evil twin” of global warming is not as evil as was once considered. If nothing else, this study shows that if we are to learn exactly how “evil” this twin is, we will need to conduct significantly more realistic experiments! 1. Committee on the Development of an Integrated Science Strategy for Ocean Acidification Monitoring, Research, and Impacts Assessment, Ocean Studies Board, Division on Earth and Life Studies, National Research Council of the National Academies, Ocean Acidification: A National Strategy to Meet the Challenges of a Changing Ocean, National Academies Press 2010, page 1, (Available online). 3. Janet Raloff, “Acidification Alters Fish Behavior,” Science News, February 25, 2012, p. 14. 4. Armin U. Form, and Ulf Riebesell, “Acclimation to ocean acidification during long-term CO2 exposure in the cold-water coral Lophela pertusa,” Global Change Biology, 18, 843-853, 2012. That is absolutely fascinating. It reminds me of how fragile and resilient living organisms are at the same time. How public will the results of this experiment be? Also, will there be a follow-up study with longer test times, different corals, and slower rates of change, say, maybe a few weeks to alter pH levels rather than a few minutes or hours? WSH, I am not sure what you mean by “how public will the results of this experiment be?” The results were published in the scientific literature. The journal is called Global Change Biology, and the specific reference is given at the bottom of the post. Most libraries have an interlibrary loan system that will allow them to get the article even if they don’t carry that particular journal. If you are asking how much media play it will get, I expect the answer is almost none. After all, it doesn’t conform to the “humans are destroying the planet” narrative that most media organizations promote. The authors say they are now varying temperature and food availability along with pH. Thus, I don’t think slower rates of pH change are being investigated by these authors.